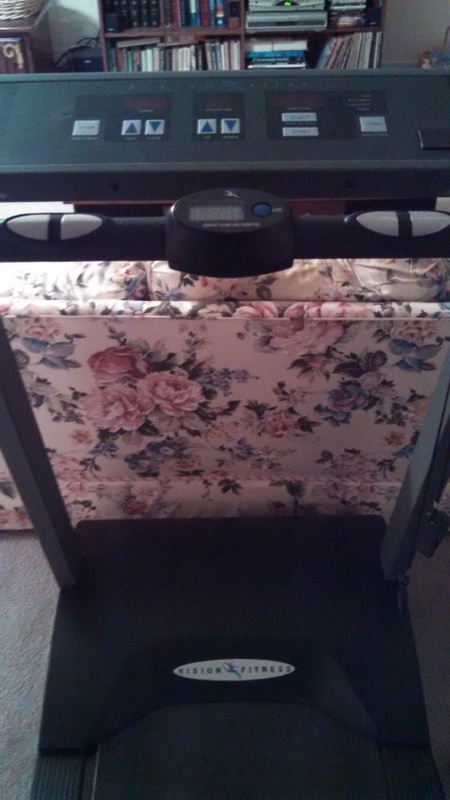 I know that all of my readers have been breathlessly awaiting an update since my August 13th post about our new treadmill and my resolution to Spartan Up! 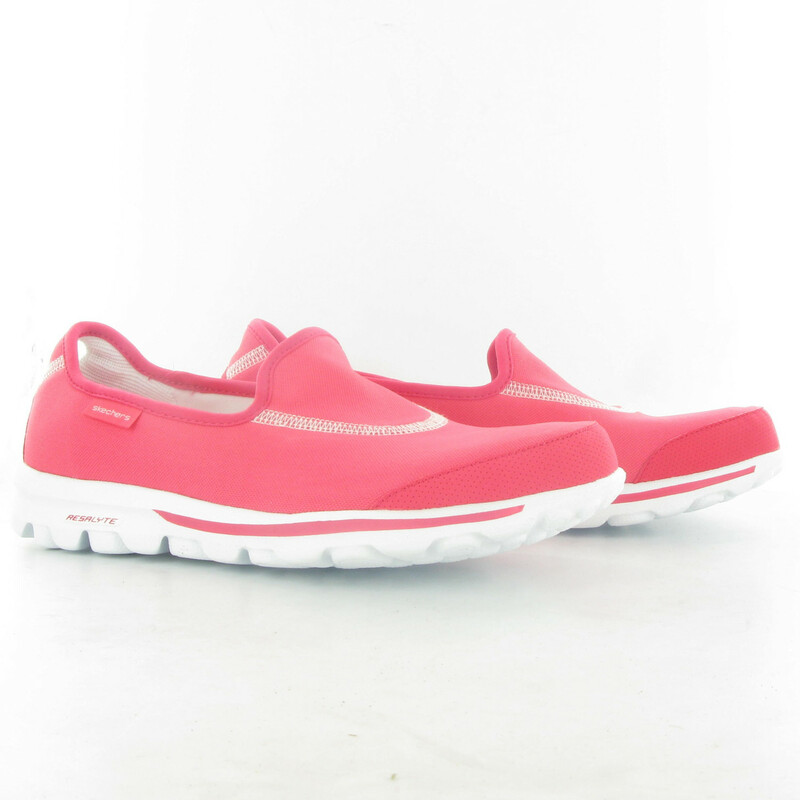 First of all, I want to let you know that I love my new Skechers Go Walks! They fit like a glove, and they’re as cool and light as advertised. I just pull them on and I’m ready to go. No socks, no lacing. 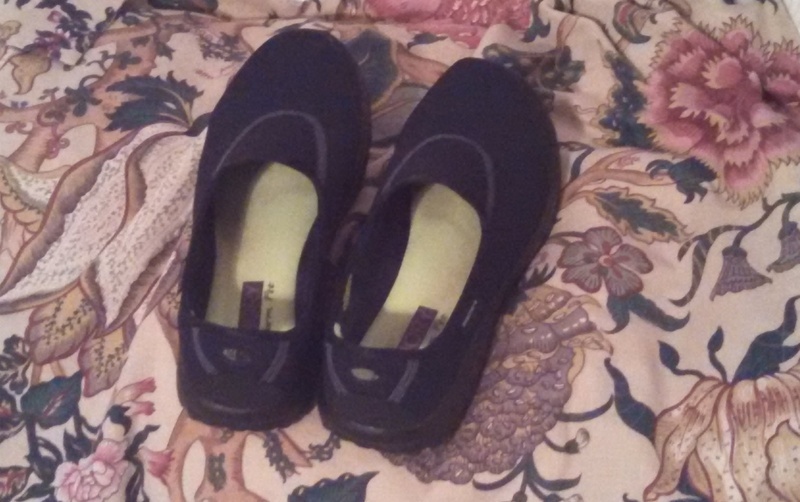 I’m not sure whether I’ll want to switch back to socks and my big ol’ walking shoes when the weather gets cooler, but we’ll see. Along with walking, I’ve been trying to do push-ups and crunches. I figure that aerobics and these two exercises will cover all of my needs. Since I’ve been working in an office, I’ve noticed a big difference in my arms. I’m sure that this has nothing to do with the years streaking by, but my forearms have turned to moosh. The only work my forearms do now is help to support my hand while it clicks a mouse—and that’s only my right hand. If you squeeze my forearms, you get moosh and bones, that’s it. After just a few weeks of push-ups, my arms seem to have more substance. After a week or so, I realized that I wanted to make sure that I did my push-ups correctly, since I’m doing them lady-style, that is, from the knees. I went on YouTube and searched for “push-ups women,” and found a very informative video that showed me that, yep, I’m doing it right. I’m learning a whole new lingo, though. During the demonstration, the guy instructor said, “Remember that the belly-button is engaged.” I beg your pardon? My belly-button is not engaged. If it were, it would certainly have told me so. Legally speaking, my belly-button is married to my husband’s belly-button. I’m pretty sure that’s how these things work. In any case, every time I exercise, I stay aware of my belly-button. So far, it hasn’t tried to run off and elope. 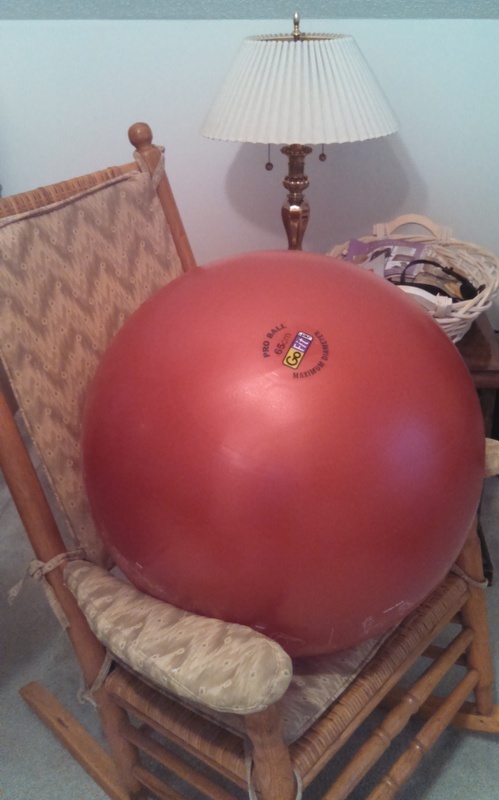 I do my crunches on the exercise ball that my sweet niece gave me a couple of years ago for Christmas, which now has squatter’s rights on the seat of our family room rocking chair. When I do give it a shock by placing it on the floor, it makes it so much easier on my back. No more excuses to avoid crunches. I do have to put it beside the sofa, though, so that I can grab the arm when I’m losing my balance. So far, I’ve only flipped over once, although it was a terrifying experience. There I am, crunching away, when suddenly I’m seeing what’s behind me, upside down. Twirling my arms in the air didn’t help, but I finally found a way to twist to the side and slide off that way. I was so embarrassed, even though I was by myself! I will not be posting a video. Treadmills are so awesome in one way, in that you can exercise like mad without leaving your air- conditioned home. I decided to walk for 30 minutes—about a mile and a half—on weekdays, increasing to two miles on weekends. I wonder what our hard-working ancestors would have thought about sweating through two miles of walking uphill, yet still remaining in the same place. What could possibly be the purpose? David finally made it onto the treadmill last week, in the mornings while I was getting ready for work. Friday morning, a persistent noise was making its way through the floorboards, and as I went up the stairs, it became more and more distinct. Bap! Bap! Bap! “What is that?” I asked. “Oh, it’s nothing,” puffed David. But then I saw something whipping around the end of the treadmill, and he had to admit that the belt was shredding. Oy! There is some force in my house that targets and destroys treadmills. Fortunately, it is possible to purchase a new belt for this model, although it is not cheap. Naturally, we had to try that universal cure for all ills before springing for a new belt, so David coated the top and bottom of the tear with duct tape. I was downstairs reading yesterday evening when he was effecting this repair, and I looked up curiously when he came down the stairs and out the back door with a flashlight. After coming back in, he confessed that the treadmill did not appreciate the duct tape under the belt, and had tripped a breaker. Fortunately, it did not burn out the motor, so I was able to walk a bit today once he removed the bottom layer of tape. How cute is that? I want one. So, after all this effort, have I been dropping those pounds like mad? Not a bit. I dropped three pounds right away, put two back on, dropped one, gained it back, and so on for three weeks now. As of this morning, I had lost almost six pounds, but tomorrow morning I could gain it all back. Who knows? I’m trying to give myself that whole pep talk about how the exercise is causing me to build up muscle, and muscle weighs more than fat, so really I’m losing fat. Yeah. So really, I have gained forty pounds of lovely muscle, which will soon start burning all that fat, and I’ll look like a body builder overnight some night. I’m not sure that’s what I was going for, to tell you the truth. And no, my clothes do not feel as if they’re about to fall off, either. If I had wanted to maintain my weight, I could have done that while eating sugar-free homemade ice cream and snacking in front of the television every evening. Believe me, I know this from experience. On the other hand, I do have another tool to measure my health: my glucometer. Every morning now, I take my fasting blood sugar, and it is doing soooo much better. I had gotten up to a morning bg (blood glucose) between 110 and 115, which is not where an unmedicated Type 2 diabetic wants to be. Since I’ve quit the evening snacks and started exercising, it’s usually around 100, and often in the 90s. Happy day. 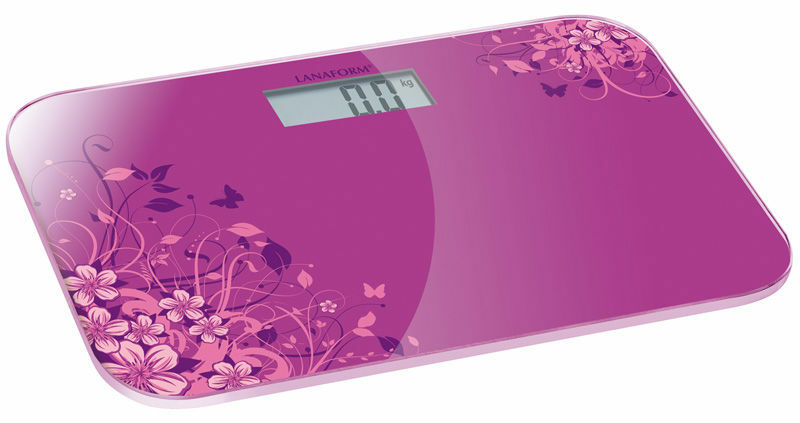 This is a better indicator of what’s going on inside than my scale. Once it even fell to 89, and my glucometer was so concerned that it asked me if I wanted to make a note. (This is what happens when you have smart appliances. They get all emotional.) I have also found a new app for diabetics that I like much more than the old one I had that suddenly got all nosy and wanted me to join a group. I uninstalled that one. This one is called My Glucose Buddy, and it seemed to get the highest reviews of all the Android apps out there. It’s free, too! It can keep track of all your stats, and it’s very organized and easy to use. If you have a smart glucometer, you can download your info directly into it, and when you’re ready, it will fax a report to your doctor. That’s great, because I never could figure out how to email a report to my doctor with the last app. I’m looking forward to the day that I’ll have a very impressive graph to show her. I downloaded it from the GooglePlay store on my phone. We low-carbers are a tough bunch. Whether it’s for weight loss, sugar regulation, gluten sensitivity, or any number of very good reasons, we are willing to look our junk food nation in the face and say, “No!” However, even though the blood test results are gratifying and (for people other than me) the scale is going down, down, down, there are two things we really miss for which we just can’t find an acceptable substitute: crunchy cereal and stretchy bread. 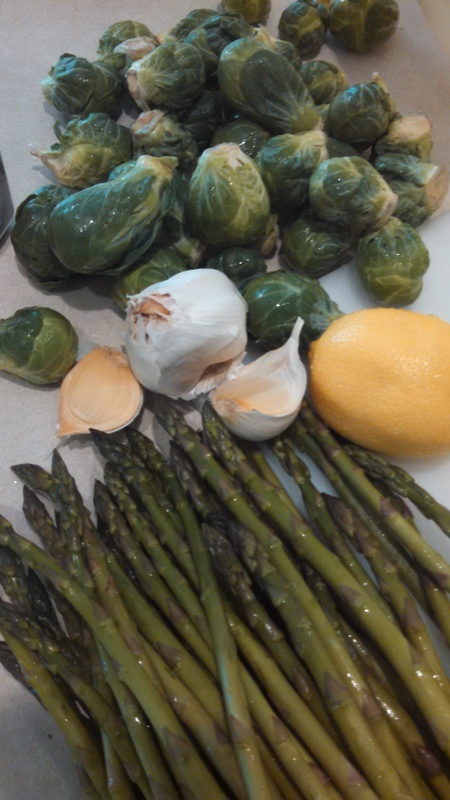 Thanks to Melissa McGhee and my sister’s internet searching, we have found two miracle recipes that you would love even if you weren’t eating low-carb, but are especially wonderful because they fill those two gaps. 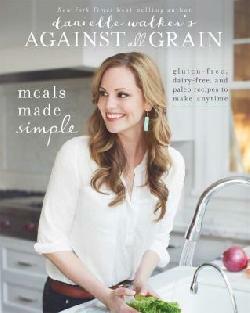 First of all, Melissa McGhee’s granola recipe, that beautiful cereal that you see above. I’ve talked about Satisfying Eats, Melissa’s cookbook and blog, several times in this space, and I continue to be amazed at her work. 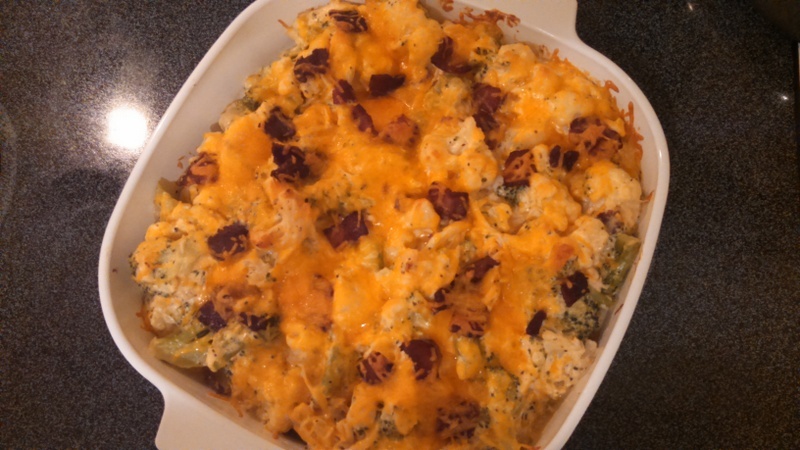 Although I do have this recipe in her cookbook, she has it posted on her blog, too. My sister made it first and said that her family loved it, and my mother tells me that she ate it right from the zip-lock bag as a snack! But, oh, it is so good with milk, and reminds me of Honey Bunches of Oats. Use whatever milk is best for you: cow’s milk, coconut milk, almond milk, or whatever. 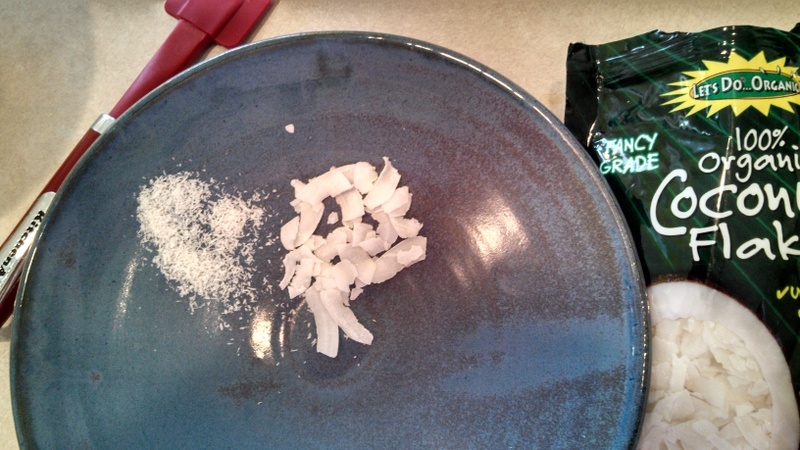 The first time I made it, I did not realize that the coconut flakes were very important to the recipe. I used shredded coconut instead, because I had it in the pantry. Not the same thing at all, as you can see! Also, please be aware that raw pumpkin seeds are green. If the pumpkin seeds you see on your grocery store shelf are white, they are coated with salt. We actually used to eat these as a snack when I was a teenager. Can’t remember why, exactly, we thought they were healthy. I had to go to Whole Foods to find raw pumpkin seeds. Rather than pumpkin pie spice, I used mostly cinnamon with a sprinkle of nutmeg and ginger. 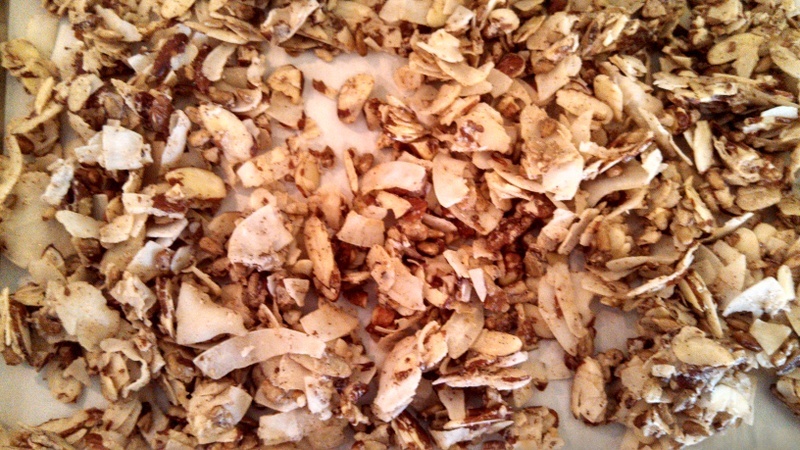 This recipe is a bit pricey, but not much more than good store-bought granola. I would show you a picture of a bowlful with milk, but it disappeared too soon. Even my carb-eating son loved it. Next, my sister told me about Mr. Peanut Sandwich Bread, a recipe that she’d found on the internet that made a flexible sandwich bread! 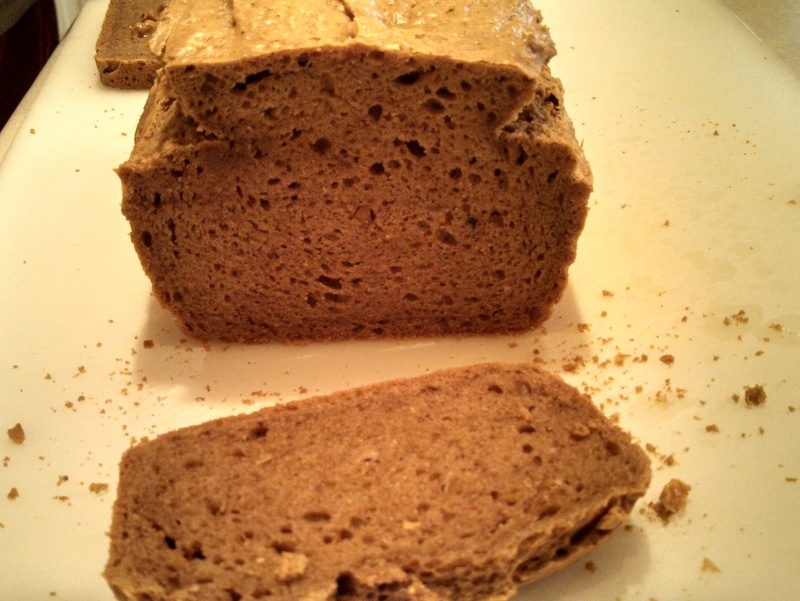 No, it’s not a sweet dessert bread, but an everyday loaf bread that actually holds together no matter what you put on it—just like a gluteny wheat bread, but very low carb with no gluten at all! Here is my favorite hand model, David (conscripted while innocently walking through the kitchen), showing you how even a thin slice bends without breaking. With only six ingredients, this bread is incredibly easy to make. I even skipped the sweetener. We’ve made ham and cheese sandwiches, pimento cheese sandwiches, and egg salad sandwiches with it without having any fillers fall out the way most low-carb breads will. It also toasts well. The top of mine popped up a bit, but I can see online that hers did, too. It is strange to add the baking soda and vinegar and then use the electric mixer. It feels as if you’re whipping up your elementary school volcano science experiment. But it works! Now all of your low-carbing dreams have come true, and you can run out and get your ingredients. You’ll probably see me there. Time to restock! I finally received my Spiral Vegetable Slicer, which will henceforth be called a Zoodler because it makes vegetables into lovely noodles. What an essential kitchen gadget for those of us who are low-carbers and love pasta! I had had it in my Amazon cart for months, just hoping for Christmas Amazon gift cards. I must be a good hinter, because I did receive some. Oh, how I wish North Carolina bloggers could get paid for click-outs to Amazon, but alas! Amazon and the North Carolina legislature have not settled their war yet, so I am going to gush on about this product purely for love, and not for profit. Here is the basic machine. 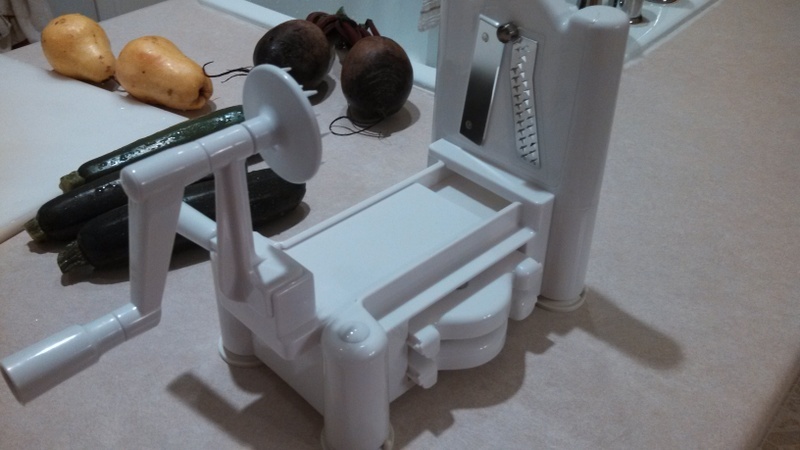 You can see that it has a spiky end that holds the vegetable in place and another end that holds a guillotine-looking blade that snaps in place. The other blades are nicely stored beneath, as you can see. There is a slicer blade that makes ribbons, a coarse shredder, and a fine shredder. Today, I am using the fine shredder. You can see my pears, zucchini, and beets waiting in the background. The first thing I zoodled was a couple of pears, which worked nicely, but needed to be sprinkled with lemon juice quickly to prevent browning. I set them aside for the pear and beet salad, and moved on to zucchini, a vegetable that is practically invented for the Zoodler. 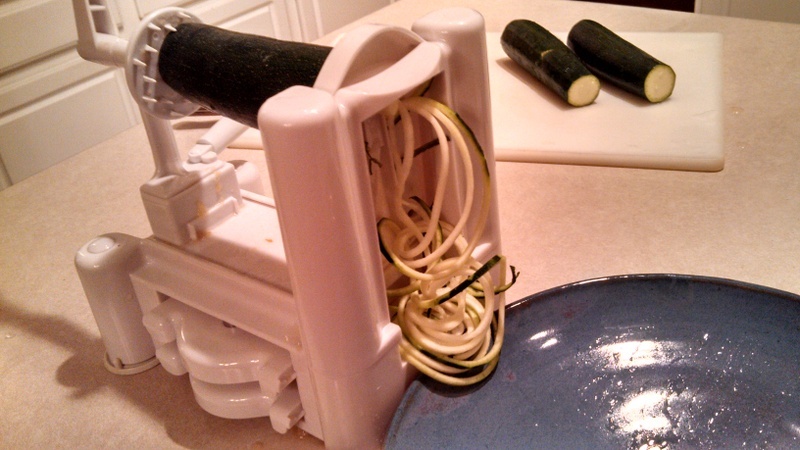 Here you can see the zoodles coming out as I turned the handle on the other end. So cute! I made a bowl full of them (top picture) from three zucchini, which leaves a weird core, as you can see. I was surprised by the core, but then I realized that the reason the pears didn’t leave cores is because they dissolved into the mush that ran down the inside of the Zoodler. Aha. No problem, though. 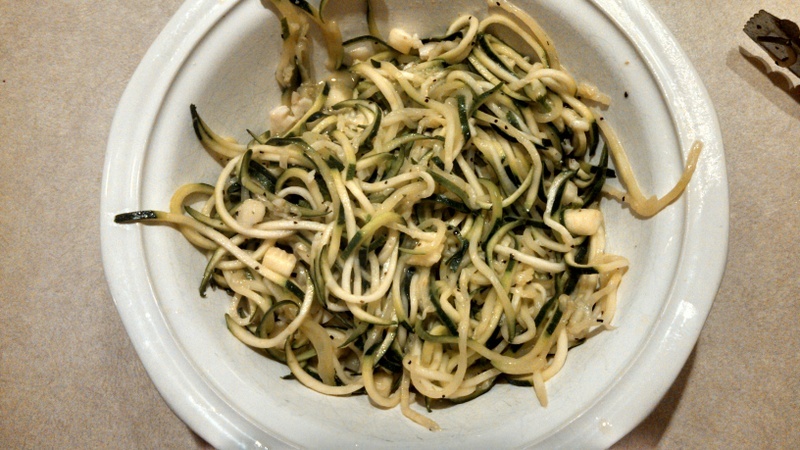 I still got a lot of zucchini noodles! 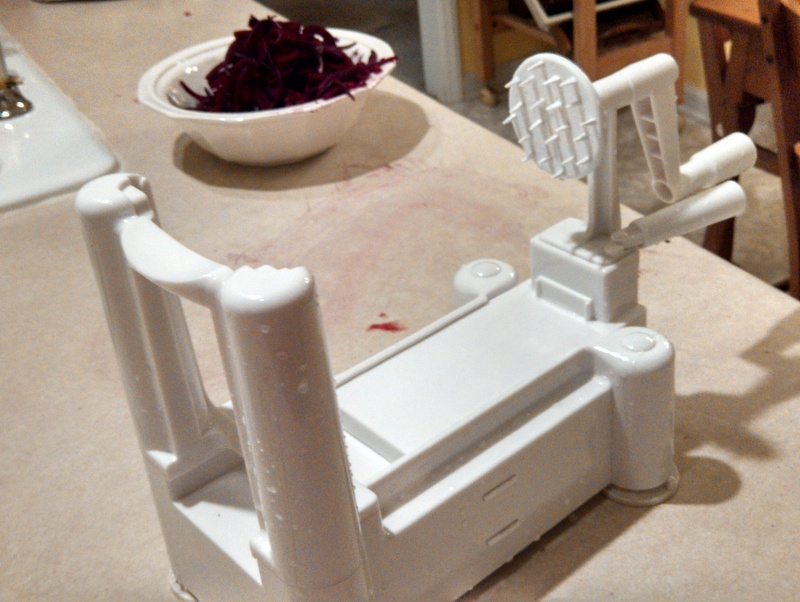 I saved the beets until last because I was afraid that I’d stain the Zoodler. 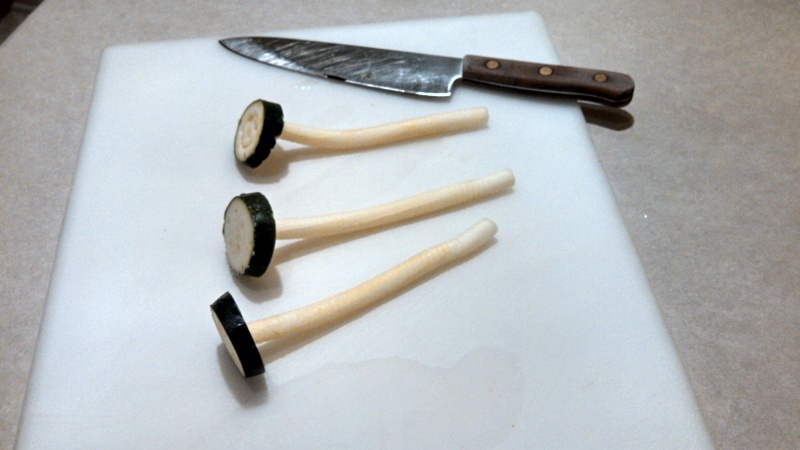 I read in the instruction manual that you can make two cuts on either side of a vegetable to get C-shaped noodles. As you can see, that worked really well, but what you can’t see is that I made the cuts too close together in the center, so after a few turns, the beets split into two pieces. Oh, well. I reconfigured and made smaller C’s. 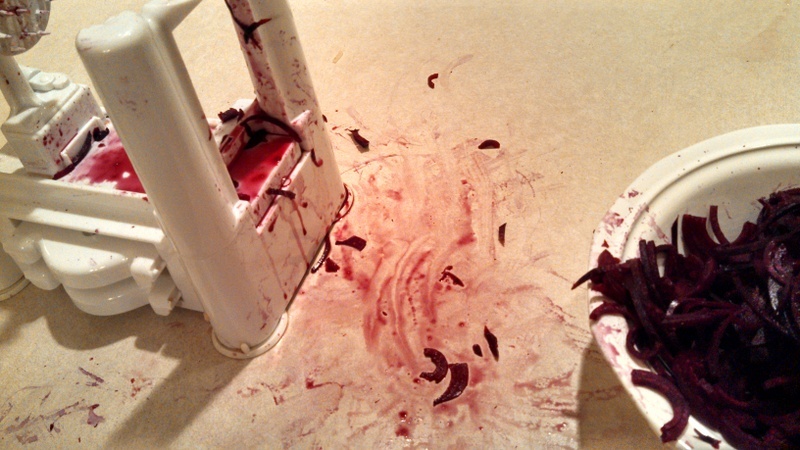 Yes, the beets made a big mess! After I was done, though, I took the gadget apart and gave it a quick rinse, and it did not stain at all. As you can see below, my counter is still a mess, but the Zoodler is shiny white again. Whew! 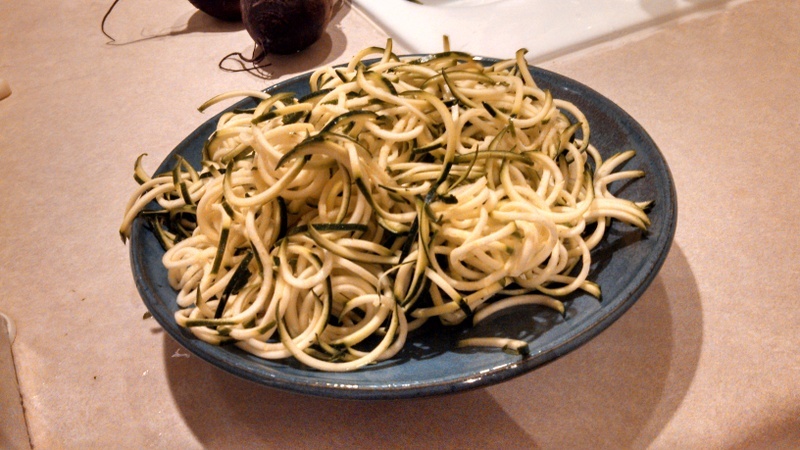 My next challenge was to cook the zucchini noodles. As you can see, I cut up the cores into little plugs and threw them in. No, unfortunately, those are not baby scallops. I heated up a bit of olive oil and a pat of butter in a large skillet and got it pretty hot, then tossed in the zoodles and some chopped garlic. 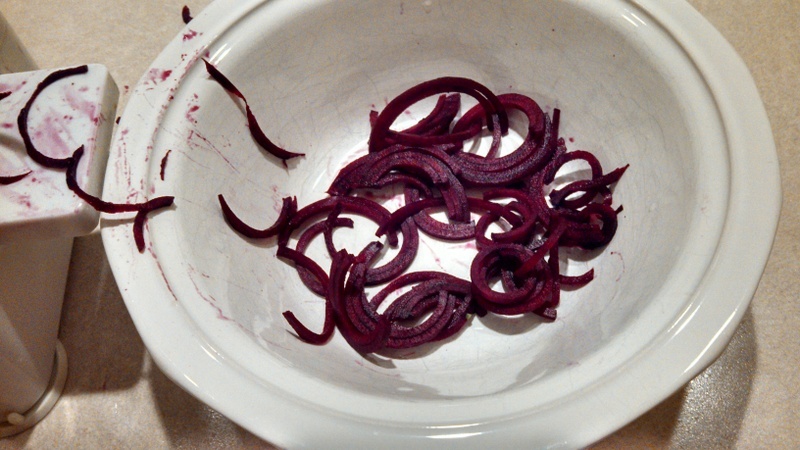 I was making the beet salad at the same time, so I didn’t pay close enough attention, and I think I overcooked the zoodles a bit. Practice makes perfect. I think it’s best to stop before they get translucent at all. However, I can tell you that they were delicious! They still held together, and we all loved them. I’m sure that this is just the first of many meals with the Zoodler! 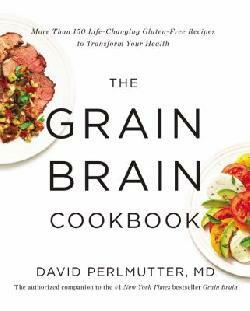 Grain Brain, by David Perlmutter, M.D. When new books on diabetes or low-carbohydrate diets are published, I will almost always read them, as you know from following this blog. However, you may not know that my father died of Alzheimer’s disease in 2004, so my siblings and I are always on the lookout for new research on dementia, as well. 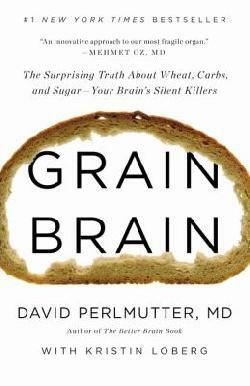 Little did I know that the two were interconnected, but Dr. David Perlmutter has put forth some very controversial and fascinating new research in his book, Grain Brain: The Surprising Truth About Wheat, Carbs, and Sugar—Your Brain’s Silent Killers. Dr. Perlmutter is a neurologist, as is his 96-year-old father, who now has Alzheimer’s, so the author has a vested interest in his subject. In the long run, this is very hopeful information, since it is the first time that anyone has stated that Alzheimer’s and other neurological problems are actually related to the food you eat, and, therefore, preventable! Until very recently, scientists believed that neurological problems were almost all due to genetics. However, with the explosion of both diabetes and Alzheimer’s in the past few decades, they began noticing that the two diseases were tracking together. Why? Although patients with diabetes and other digestive issues tend to show symptoms years before the final diagnosis, the damage wrought in the brain by grains is silent until it is too late. Dr. Perlmutter began drawing connections between the rapid increase of carbohydrate consumption since the advent of the low-fat, high-carbohydrate government dietary guidelines and the increase of inflammation-related neurological disorders, including dementia, ADHD, Tourette Syndrome, epilepsy, depression, Parkinson’s disease, migraines, and even autism. We consume much more gluten in our diets today than we ever have before, both because of our dietary guidelines and because of the change in our wheat, as outlined in Dr. William Davis’ Wheat Belly*, quoted often in Grain Brain. Gluten contains substances that connect directly to the opiate receptors in the brain, resulting in a very real addiction. But it is not only wheat, but all kinds of carbohydrates that cause inflammation throughout the body, including in the brain. Even people who are not showing gastric signs of gluten sensitivity are being affected. Just as the medical establishment has decided that 40% of the population should be on statin drugs just on general principles, Dr. Perlmutter sets out to convince us that cholesterol is not bad for us. I have not heard that opinion since Drs. Michael and Mary Dan Eades, who wrote Protein Power in 1999, published a graph showing how cancer rates rise much more precipitously under 140 total cholesterol than heart disease rates do over 200 total cholesterol. Cholesterol is a substance that maintains the integrity of the cell wall throughout the body and is necessary to form the synapses between brain cells. Perlmutter notes that the Framingham Heart Study shows that people with higher cholesterol also have higher cognitive strength. Although he is not a fan of statin drugs, since cholesterol is obviously important to brain health, he does acknowledge that inflammation is the root cause of many of our most dangerous chronic illnesses today (thereby agreeing with Dr. David Agus in The End of Illness*), but he believes that the inflammation is caused, in large part, by what we eat. For most of history, scientists believed that brain cells were fixed, and although they could be damaged, they could never be repaired or replaced. The very encouraging news that the human brain can, in fact, regenerate is a real motivator to follow Perlmutter’s guidelines to maintain and improve your habits early in life so that you can avoid serious consequences later in life. 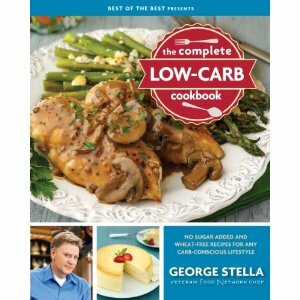 There is not even room in this review to tell you all that Dr. Perlmutter has to say about movement disorders, depression, fructose vs. glucose, how exercise affects your brain, and so much more, but about two-thirds of this book sets out the research and reasons for changing to a low-carbohydrate diet. 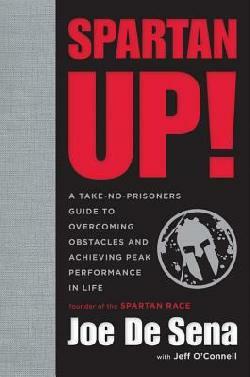 The final third is a very practical guide to help you make that change. Dr. Perlmutter lays out a four-week plan to change your diet, exercise, and sleeping habits, and follows with menu ideas and recipes. The recipes, compared to many of the fabulous cookbooks I’ve reviewed, are quite basic, but when you’re new to the idea of giving up bread forever, basic can be very helpful. He also has charts of recommended supplements, good vs. bad oils, lists of gluten-containing substances, and more. By this time, I hope that our culture is waking up to the fact that carbohydrates are not contributing to optimum health. 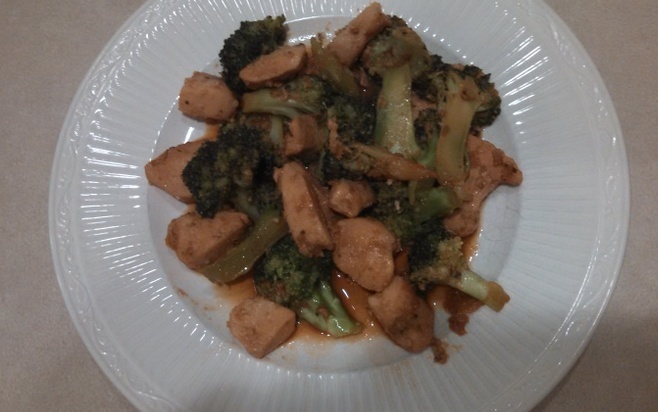 Unfortunately, it is still difficult to find healthy choices in restaurants, and I still have to shop online or in more expensive stores to find some of the basic items in my pantry. I suppose eating well has always been more expensive, but I hope that almond flour, grass-fed beef, and a wide variety of non-starchy vegetables will soon be more mainstream. There are many restaurants out there whose side dish options extend to baked potatoes, fries, or rice. No wonder we’re all so sick. I highly recommend Grain Brain to everyone, because we all know someone suffering from ADHD or depression right now and we all need to help ourselves to avoid dementia in the future. Add it to your pile of books on the carbohydrate-diabetes connection, and before you know it, you’ll put away the chips and soda. Just switch to red wine and dark chocolate! *These titles are also searchable in this blog. Sometimes they were discussed within wider posts on the topic.